Annual Renewal from April 12 - June 30th, 2019. BECOME A WOCG MEMBER: $199.00 annually. You may pay conveniently using a secure payment through Paypal. Women of Color Golf (WOCG)has been honored by the United States White Houses to receive the prestigious recognition as "The White House Champion of Change", in golf for women and girls. WOCG has a mass appeal and relationships with the World Golf Foundation (WGF), We Are Golf, Golf for Her, The Advocates Pro Tour and Golf.My Future.MyGame. Your membership to WOCG supports our girls youth programs and minority LPGA Tour Players seeking opportunities and sponsorships to compete on the LPGA Tour! WOCG is a certified 501C3 Not-for-Profit Organization. Don't miss our next annoucement !!! Volunteer or to see other ways to get involved! 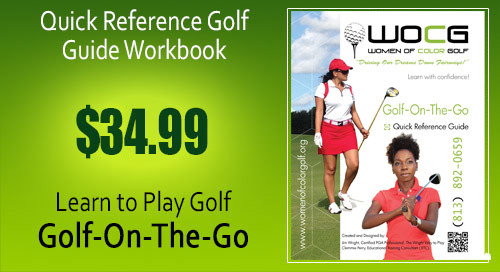 Learn to Play Golf -Golf On the Go Quick Reference Guide Workbook.